All because of money? Two suspected ritual killers, disguised as mentally challenged person, were on Saturday discovered under the Otokutu Bridge in Ughelli South area of Delta State. It was gathered that a would-be victim blew the lid on the suspects after managing to escape. The latest incident came 12 years after police recovered decomposing corpses under the same bridge in 2004 from a gang of ritual killers. The suspects were handed over to the Jeremi Police Division. Calls placed across to the Police Public Relations Officer Celestina Kalu (SP) were neither received nor returned as at the time of filing the report. 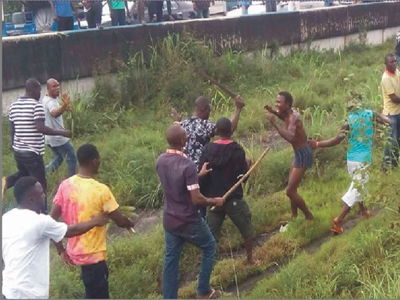 An eyewitness at the scene told The Nation that, “Two men looking like lunatic attacked a lady who was gathering sharp sand along the road side on the Otokutu end of the bridge. “They were struggling with her trying to drag her to their hideout under the bridge. The helpless woman started shouting and alerted passers-by. Another witness said: "the sight of several school bags belonging to pupils, several clothes and women bags convinced the mob that ritual killers are back in Otokutu Bridge."